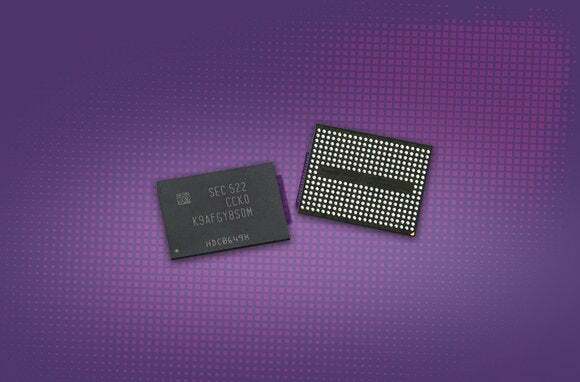 Samsung says it can cram more storage capacity into SSDs thanks to a new 48-layer V-NAND technology that puts 32GB of storage on a single chip. Samsung is doubling down on SSD density. After announcing 32-layer, 3-bit-per-cell V-NAND flash in August 2014, the company recently announced an upgrade to 48-layer, 3-bit V-NAND. The new development will double the density of current 128 gigabit NAND flash chips to 256Gb. In storage terms, this means Samsung can throw 32 gigabytes (with a “y”) onto a single die and “easily double the capacity of Samsung’s existing SSD line-ups, and provide an ideal solution for multi-terabyte SSDs,” the company said. On top of the storage gains, Samsung says the new 48-layer V-NAND will offer more than 30 percent power savings compared to 32-layer V-NAND and be 40 percent more productive. Samsung’s V-NAND belongs to a family of storage technologies also known as 3D NAND. Under this scheme, layers of data-storing cells are stacked vertically to increase the storage capacity of a single chip. The story behind the story: Increasing storage capacity for SSDs is all the rage in 2015. In March, Toshiba announced 48-layer NAND in 128Gb configurations and followed up with a 256Gb version in partnership with SanDisk earlier in August. Intel and Micron also announced in March a new 3D NAND technology that can achieve 256Gb and 384Gb die with 32 layers that fit in a standard package. Of course all this NAND talk may be obsolete in a few years. In July, Intel and Micron also announced a technology called 3D XPoint that promises to be more durable and 1,000 times faster than current NAND technology. Samsung says it will produce its latest V-NAND chips for the rest of the year. It’s not clear, however, how long it will be until we see 48-layer chips land in Samsung’s superb EVO series of SSDs. The company is already selling 2TB SSD drives at the consumer level using 32-layer V-NAND. Its latest announcement suggests that 48-layer V-NAND will end up in the enterprise first, which is typical for most new storage tech.